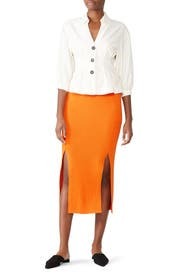 Like walking in sunshine, this vibrant Mara Hoffman skirt features figure-flattering ribs and dual slits at the hem. We love styled with Free People's Night Moves Top. Orange cotton (100% Cotton). Skirt. Fully lined. 19" from waist to top of slit, 34.5" from waist to hemline. Imported. Super comfortable but unforgiving. Wore with a long sweater to hide my tummy pouch. Wearing Spanx with a wool skirt seemed to defeat the purpose. Received many compliments and really liked the colour. 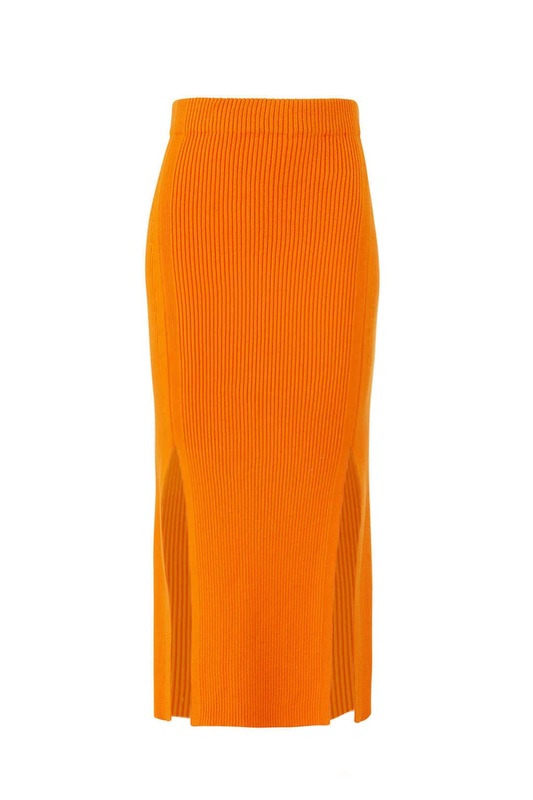 Fab for the right body shape! Didn't wear as made me look big but for someone with the right body shape would be fantastic! Weird in the best way! The waistband is a bit thick, so looks best with something tucked in, or would pair with an oversized sweater too. The double slits are dramatic - perfect to show off rad boots or tights! Overall it's a stretchy knit fabric that is comfy and cozy. Stretches a bit with bulky sweater material but color is beautiful! This skirt is so fun and soft. I loved it and got a lot of compliments. The color is amazing and I would totally rent again. 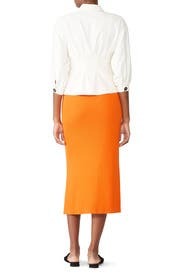 Cute skirt, heavy material but in my case it ran kind of large, making the fit weird. I wish it hugged the body a bit more. Could possibly be better for the spring/summer time. 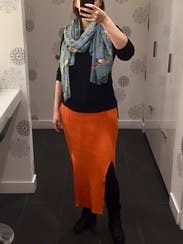 I rented this skirt, mostly because it was "on brand" with my job and ended up wearing it SO many times in the month that I had it - everyone kept telling me what a great color it was on me! and the stitching and fit made it very slimming. Too big. Lots of stretching. I sadly didn't end up wearing this piece. 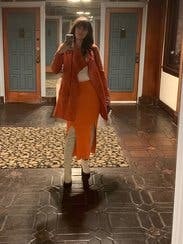 My hips looked like a big orange pumpkin in it and I didn't have good colors for layering to tone it down with. Color is punchy and fun though and it was very comfortable but not flattering. 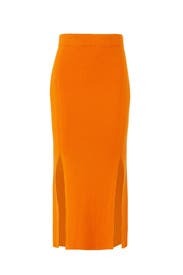 Love orange and Mara Hoffman. I would purchase if my size S is available. I'm 5'5" and had to lift the skirt to ascend stairs.